The Pulsair’s water tank mixing systems are the best solution for drinking water storage tanks actively mixed to avoid thermal stratification, reduce the formation of nitrates and lower disinfection by-products (DBP). Pulsair Systems offers the fastest, most effective low energy cost solution for actively mixing large potable water storage tanks. Our proven sanitary mixing process is up to 80-90% more energy efficient than traditional mixing methods and addresses all the major challenges of potable water storage tank mixing. The Pulsair mixing process works by producing sequentially timed pulses of compressed air to generate large bubbles at the tank bottom. The rising bubbles create an immediate vertical circulation pattern in the tank that stirs and blends 100% of the water in the tank. The Pulsair tank mixing process is the fastest and most energy efficient because it uses gravity to do the work of mixing. The only energy consumed is during the process of compressing the air. Once the bubbles are released at the tank bottom, no more energy is consumed. The water in the tank continues to move long after the bubbles reach the water surface. Pulsair systems uses a vertical active mixing process to quickly break up stagnant layers of water and reduce the formation of thermoclines and thermal stratification in potable water storage tanks. The rising bubbles create immediate vertical mixing circulation pulling colder water up into the tank to achieve uniform water temperature. Active mixing of potable water with the Pulsair mixing process helps to eliminate nitrification that may occur where chloramine is used to disinfect drinking water. The Pulsair mixing process quickly mixes multi-million gallon water tanks to achieve uniform water temperature reducing the occurrence of nitrification. This saves time, money and conserves water because operators no longer having take tanks off-line or deep-cycle tanks. Potable water tank mixing with Pulsair helps protect against trihalomethanes (THMs) and helps ensure EPA Stage 2 DBP Rule compliance. Thermal stratification and thermoclines are eliminated which can elevate THM levels. Intermittent rising air bubbles from the Pulsair mixing process creates vertical in the tank and increased agitation at the water surface keeping the water in motion which greatly reduces the formation of ice or freezing in the tank. Potable water tank mixing should happen fast and the mixer should be responsive to unforeseen events that require immediate mixing to occur. Unlike small mechanical mixers that can take up to a week to completely mix a potable water tank or passive duckbill nozzle can only mix when the tank is being filled, the Pulsair mixing process can mix 100% of the water in a multi-million gallon tank on demand. Pulsair custom engineers each potable water tank mixing system to fit all types and capacity tanks. Whether the tank is 3,000 gallons or 3 million, elevated, ground, standpipe or an underground reservoir, the Pulsair mixing system can be custom designed to meet every need. 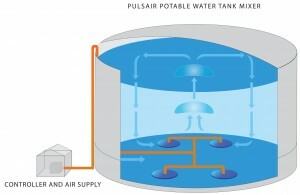 Additionally, the Pulsair water tank mixing system can operate at any water level. Why to choose Pulsair water tank mixing systems? The Pulsair mixing process is an ‘Active’ mixing process and ensures that all the water is mixed whereas ‘Passive’ mixers only work when the tank is being filled which can result in higher costs. Water can be 100% mixed at ANY liquid level and in any tank geometry. Other systems require their mixers taken offline when the water falls below a certain level. Uniform temperature can be achieved in a matter of minutes. Mechanical technologies can take days to completely mix a tank. No maintenance needed inside the tank after installations. Other suppliers guarantee their product for up to two-years – whereas Pulsair mixing systems have a history of over 25 years without any maintenance issues inside the tank. Efficiently mixing large multi-million gallon tanks is done easily and quickly with the Pulsair mixing process. It is the most efficient and fastest type of water tank mixing. Provides uniform temperature distribution and consistent water quality without any deadzones. Electric motors and water don’t play well – the water always wins. Electric motors = more maintenance. Guaranteed. Installation costs should be considered in addition to the mixer itself. Equipment replacements costs should be considered as well.